Zyrobotics, a leading assistive technology company, today announced the launch of OctoPlus, enabling teachers and parents to provide math instruction to young children and children with special needs on an individualized basis. OctoPlus provides kids with fun, interactive math addition problems that are accessible based on a student’s math skill and disability – whether for regular daily practice or to challenge a student beyond their current skill level. OctoPlus is available on iTunes at https://itunes.apple.com/us/app/octoplus/id959757516?ls=1&mt=8 . OctoPlus is based on the U.S. Common Core curriculum, which provides a consistent understanding of what students are expected to learn, so teachers and parents know how to help them. 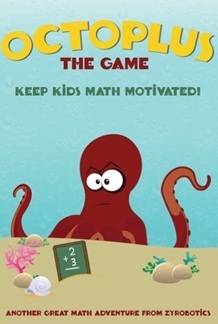 Based on a math adaptation of Turtle Invaders, a 2014 Gold Winner of the Mom’s Choice Award for Best in Family-Friendly Products, OctoPlus reinforces key math skills within an interactive gaming environment. OctoPlus places the child in an underwater water world where they have to battle turtles using their math addition skills to score points to be used in the OctoStore. With both a drill and challenge mode, children’s math skills are improved based on their own individual learning ability. OctoPlus is also designed to enhance motor skills for young children and kids with motor or cognitive delays. With a phenomenal ability to set options, this app will keep kids motivated and engaged. The app is designed to improve visual attention, timing, coordination and control. Parents can also use this switch-accessible app to reinforce Individualized Education Program (IEP) goals. Zyrobotics has designed an app with a phenomenal ability to individualize settings such that the unique needs of each student are addressed. Both graphics and sound can be graded for sensory sensitive kids or for kids that are easily distracted. The app also has the ability for parents and teachers to monitor the student’s progress through the Parent Zone. Parents can also reduce and then add back visual input, or adjust the speed of the game and difficulty levels, thus ensuring both confidence and competency by being able to start on the child’s functional level and then progressing them as they are able. By changing things just a little, a kid will be able to master the math content bit by bit. Best of all, this app is designed to be switch-accessible such that children who have severe motor impairments and use a switch to activate or operate toys, computers, communication devices, etc. can practice the same math skills as all kids. Zyrobotics, LLC is an inclusive technology company. Our mission is to enable freedom through technology by developing products that are adaptive to each individual’s capabilities. For children, our products uniquely focus on accessible play. Zyrobotics’ first product offerings include accessible interfaces and smart toys, socially assistive robots, and a suite of educational apps that are specially designed to enable educational and accessible play. The company, conceived in the summer of 2012, was officially incorporated in 2013 as a Georgia Tech Venturelab spin-off company.